The sling trainer Bundle S is a set of two of the best selling products of our brand aeroSling. The ELITE Plus is our best sling trainer and the aeroSling Mount the perfect addition. 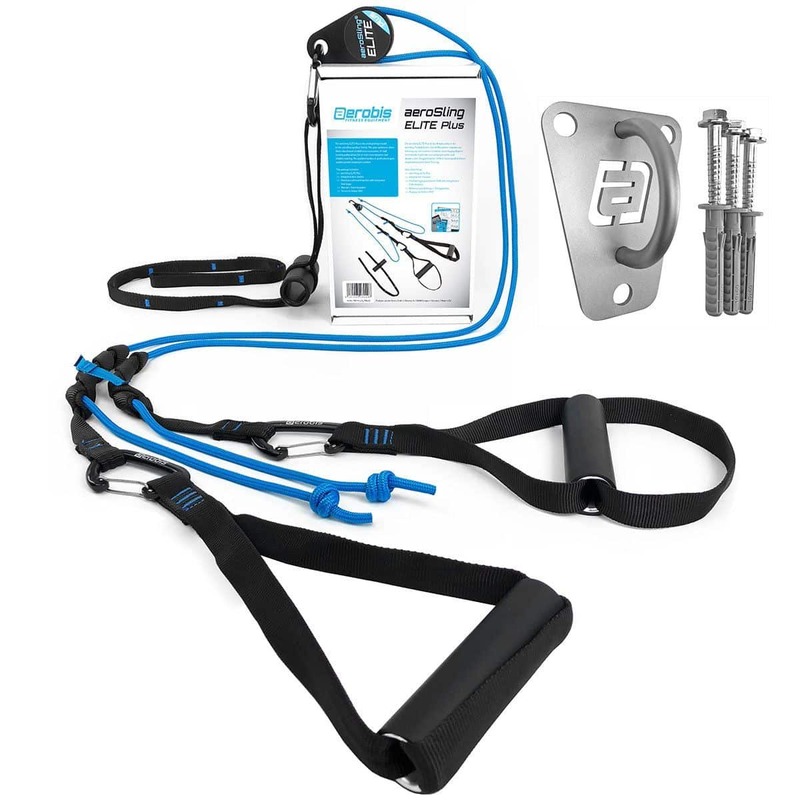 With this bundle the sling trainer can be used indoor as well as outdoor optimally. The aeroSling Mount is made entirely of stainless steel and makes a great impression even if no aeroSling sling trainer is attached. The elegant stainless steel eyelet and broad base plate make it the best option to attach a lot of our products. A highly compact and extremely robust device for quickly mounting an aeroSling sling trainer in your own home. The aeroSling Mount is delivered with a bolt and dowel combination built in Germany. It is easily mounted and ensures a high stability in non-cracked concrete. The bolts can be fastened using either a hexagonal wrench or a Torx driver so you don't need to worry about ruined Philips screw heads! The aeroSling Mount is approved and certified for a weight up to 200 kg of dynamic load. Many of our products are often purchased together. For example the sling trainer aeroSling ELITE Plus and the aeroSling Mount wall and ceiling mount. The aeroSling ELITE Plus is the best sling trainer from aerobis. The sling trainer combines best quality with maximum training fun. Every component of the ELITE Plus has been optimized over time. You can’t have more fun and success with a sling trainer with deflection pulley than with the ELITE Plus. The aeroSling Mount is the perfect supplement for your sling training. Although the sling trainer can be attached at home with the door anchor over the door, this is not optimal. A little more height and room to move are important. If you hang the sling trainer on the Mount (Mount 2m distance to the walls) you have the right freedom of movement to enjoy the sling training with all its advantages.